Bryce Harper speaks at the Vegas Strong Benefit concert at the T-Mobile Arena, Friday Dec 1, 2017 in Las Vegas. Celine Dion, Imagine Dragons and other top performers appeared onstage at the Vegas Strong Benefit Concert on Friday in Las Vegas' T-Mobile Arena, the largest musical event to pay tribute to the victims of the October 1 shooting. From inside a 32nd-floor suite at the Mandalay Bay Hotel, a male gunman fired below into the audience of the Route 91 Harvest Festival, killing 58 people and injuring hundreds more before shooting himself dead. It marked the worst mass shooting in modern U.S. history. Dion appeared in a video recorded in October at one of her concerts in Caesars Palace's Colosseum, saying, "We dedicate tonight's show to all the victims and their families and to the first responders and to the doctors and nurses who are working around the clock to save lives. And to so many heroes who did whatever they could to help complete strangers at a time of desperate needs." All proceeds from the concert are set to go to the Vegas Shooting Victims Fund. Dion had also donated the proceeds from her own show to the shooting survivors. In November, Dion had appeared in person at a smaller Vegas Strong Benefit Concert at the OMNIA Nightclub in Caesars Palace, where she joined DJ Steve Aoki to perform a special version of her hit ballad "My Heart Will Go On." Jason Aldean also appeared at Friday's Vegas Strong Benefit Concert via videotaped message. 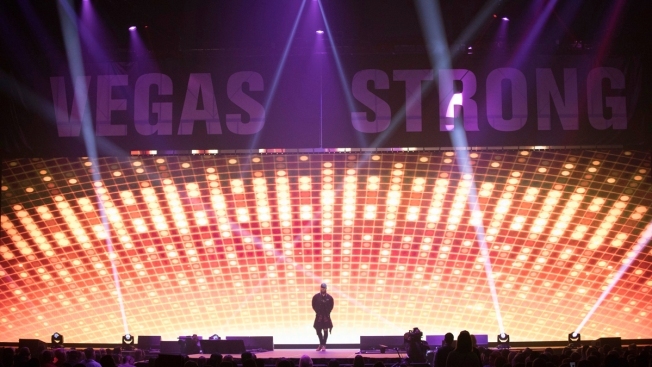 He told the crowd, "Be louder than the bad guys," according to the Las Vegas Review-Journal. He said he couldn't be there in person because his wife is due to give birth, the outlet reported. Brittany Aldean welcomed their first child, a boy, that night. Aldean is one of the survivors of the shooting, which took place while the country star was performing onstage at the Route 91 Harvest music festival. Aldean was unhurt. At the Vegas Strong Benefit Concert on Friday, Imagine Dragons and The Killers performed onstage separately and also performed Elvis Presley's "Viva Las Vegas" together along with other acts, marking the first time the bands, who both formed in Las Vegas, have shared a stage. "Today, more than ever, I am proud to be from this city," Imagine Dragons frontman Dan Reynolds said. "Music shows that there is nothing that should divide us. Tonight, we are one. We are Vegas Strong." The Killers performed "Be Still" while the names of the people killed in the shooting were displayed on the screen. The band closed the show with hits such as "When You Were Young" and "Somebody Told Me." "There's enough love in this room tonight to light up Las Vegas," singer Brandon Flowers said. There were also live performances from the likes of Penn &Teller, David Copperfield, Blue Man Group, Cirque du Soleil and Boyz II Men, who told the crowd, "This show is a testament to how strong Las Vegas really is." "It is best to use our talent to lift people's spirits and put a smile on their face," Wayne Newton said onstage, before introducing Elton John, who addressed the audience via video and performed "Your Song" and "Don't Let The Sun Go Down On Me," while the crowd joined in.